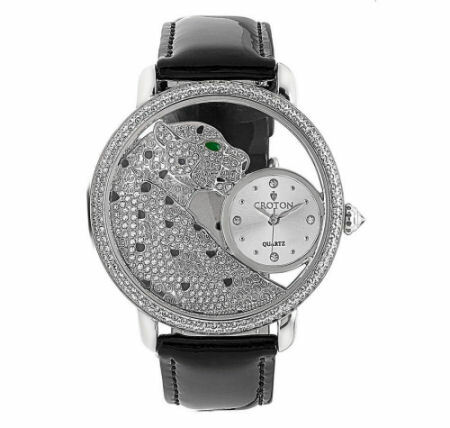 Animal motifs aren't just child's play anymore—Croton makes it a wearable trend for the established woman with this elegant and fashionable feline timepiece. Croton is a timepiece company who sought to establish its very essence on quality, precision and style back in 1878, more than 130 years ago. As Croton evolved through the years it remained loyal to its origins, always striving to innovate and captivate consumers with its ability to consistently create highly sought after timepieces, ever so precise, at a value all are quick to recognize. By the mid 1900’s Croton had become one of the most sought after and respected names in watches. From the start, the goal was to to embellish Croton’s already stellar image by producing the highest quality timepieces at the best value possible, supported by a rare lifetime warranty on every watch movement. Within this very demanding framework, Croton assembled an impressive team of experts who continually challenged themselves to produce wonderous time tracking devices, built from concept to production, by the very best designers and craftsmen utilizing the very finest materials available. Shipping & Handling: $5 within the contiguous United States. If shipping to Alaska, Hawaii, Puerto Rico, or Canada $15 additional.